You will never go back to just Pumpkin Pie again! Introducing Pumpkin PRALINE Pie – a Thanksgiving and Christmas must! 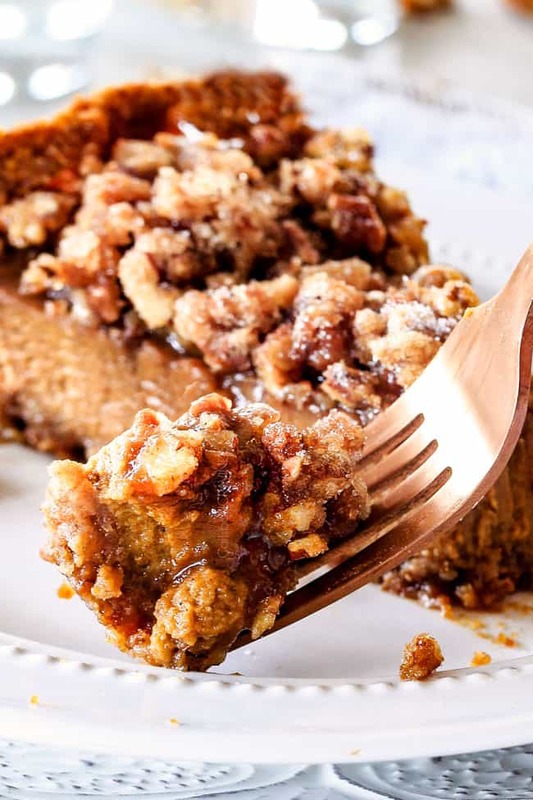 Pumpkin Praline Pie is creamy pumpkin pie topped with crunchy, chewy brown sugar pecans for the perfect flavor and texture combination in every bite! Be the hero of Thanksgiving with this new twist on the comforting classics! With Thanksgiving just days away, you probably have your menu set, but if not, or if you are planning on bringing Pumpkin Pie, then I strongly recommend you mix it up this year with either Pumpkin Ice Cream Pie or Pumpkin Praline Pie, After all, no Thanksgiving is complete without comforting, creamy pumpkin pie BUT no Thanksgiving is complete without nutty, brown sugar Pecan Pie. Every year, everyone has a favorite pie, and every year, multiple pies are made to appease everyone’s loyalties. But what if you could combine two favorites – would the pie become that much more delicious? The answer is a resounding yes! The answer is this Pumpkin Praline Pie. 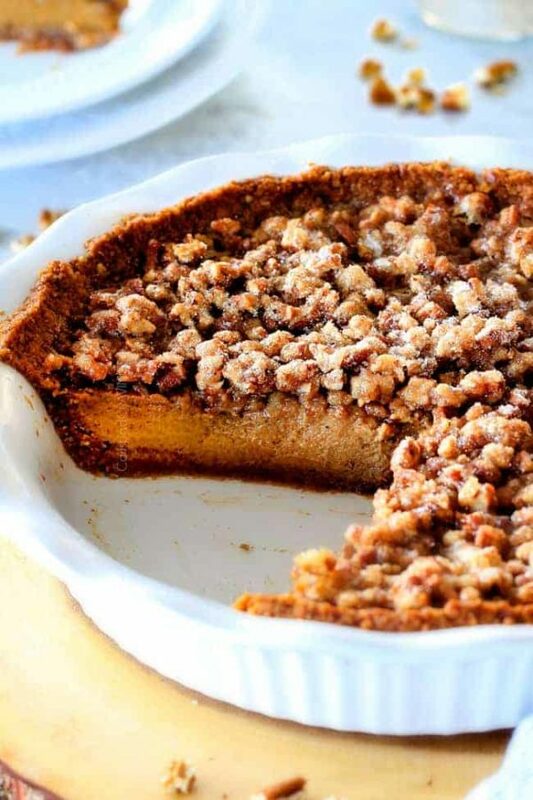 The praline topping is the icing on an already delicious but one-note-creamy texture pie. The sugary pecans add a much needed satisfying candied crunch that leaves you wanting more and more and more. As every pie should. To make this Pumpkin Praline Pie structurally sound and not too sweet, we can’t just pop one pie on top of the other. A traditional pumpkin pie isn’t sturdy enough to support an additional topping so first we whisk pumpkin, sugar, cinnamon ginger, nutmeg, salt, and cloves together in a medium saucepan then cook for 4 minutes. 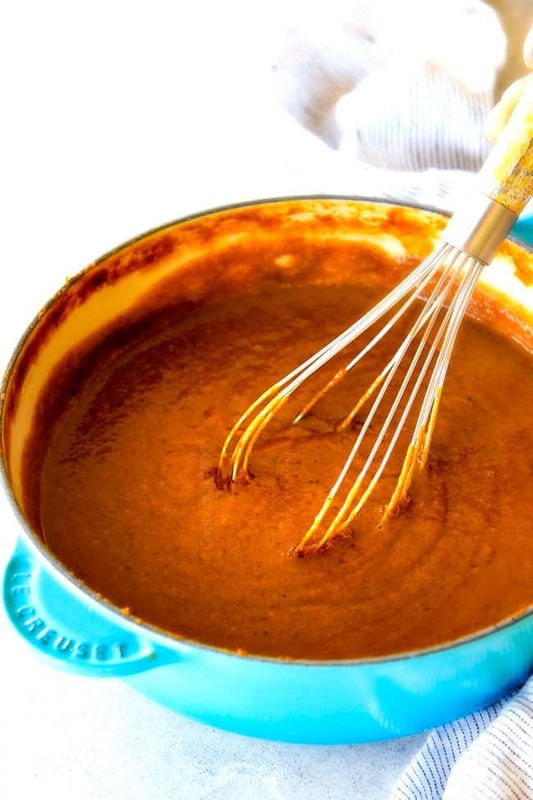 This additional 4 minute step is crucial as it evaporates extra liquid in the pumpkin for a thicker, sturdier, more concentrated pumpkin filling. Next, we remove the filling from the heat and whisk in in evaporated milk followed by eggs and vanilla. Finally, we pour our filling into our pie crust and bake for 40-50 minutes. We want the pie to be cracked around the edges (will be covered by the topping), as the secret to the best pumpkin pie is a filling that is thoroughly set. For the easy Praline Topping, we combine chopped pecans, brown sugar, vanilla and a small amount of corn syrup. We sprinkle this Topping over the Pumpkin Pie and bake another 20 minutes, just long enough for the pecans to roast and the topping to clump as the buttery browns sugar and corn syrup melt and coat the pecans. This super easy, simplified approach to the Praline adds a buttery, cinnamon brown sugar crunch without all the work of boiling pecans with corn syrup for a sticky topping that is too sweet when paired with Pumpkin Pie. This Praline Topping, however, is perfection. With one bite of this Pumpkin Praline Pie with its creamy rich pumpkin custard base and crunchy brown sugar butter pecan topping and the great Thanksgiving table pie divide will be united in Pumpkin Praline Pie love. Happy Pie Day! 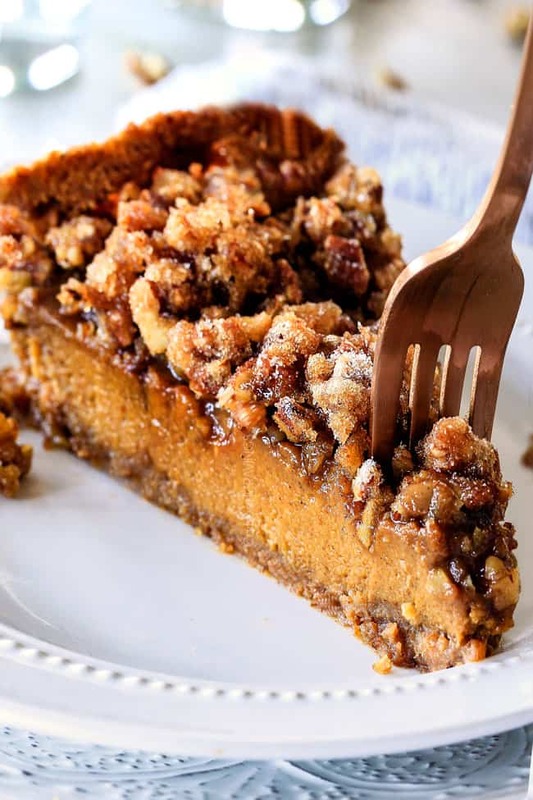 Want to try this Pumpkin Praline Pie Recipe? Pin it to your Thanksgiving, Christmas, Pie or Dessert Board to SAVE for later! 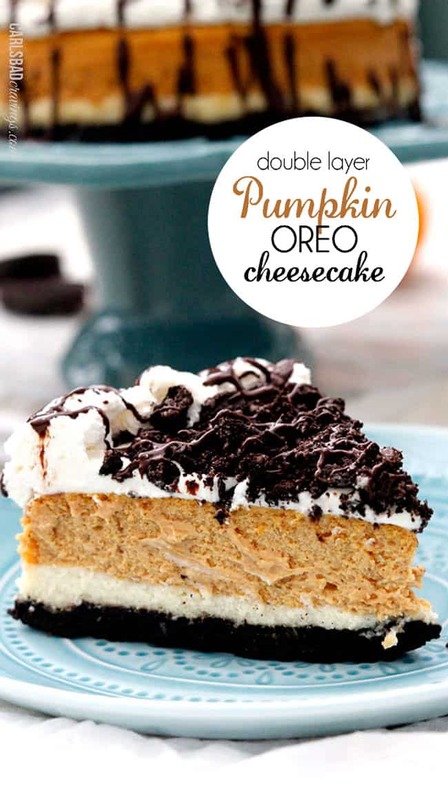 You will never go back to just Pumpkin Pie again! Introducing Pumpkin PRALINE Pie - a Thanksgiving and Christmas must! 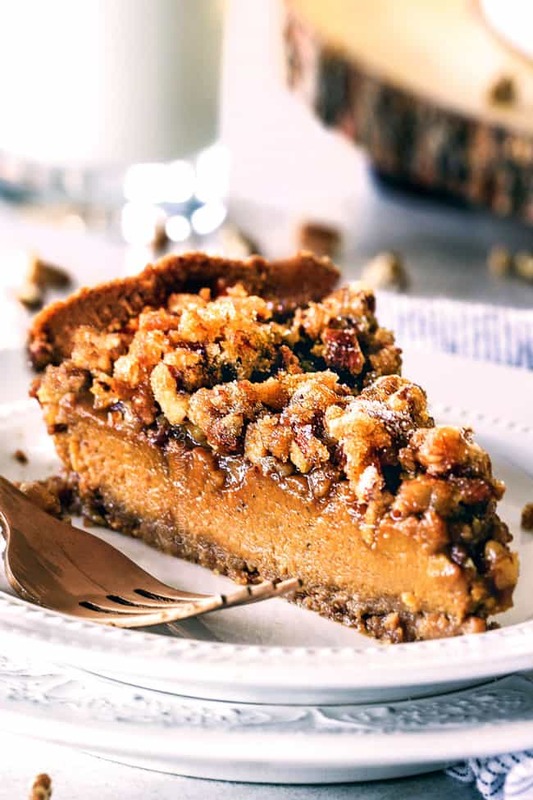 Pumpkin Praline Pie is creamy pumpkin pie topped with crunchy, chewy brown sugar pecans for the perfect flavor and texture combination in every bite! 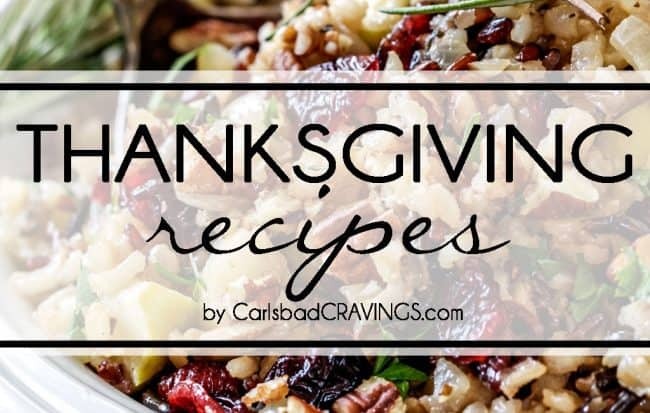 Be the hero of Thanksgiving with this new twist on the comforting classics! Prepare Pie crust according to directions, baking 10 minutes and letting cool completely. 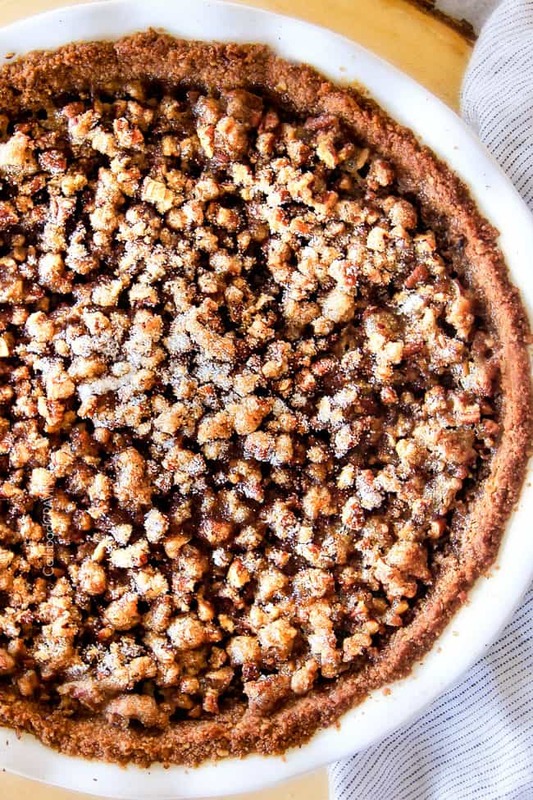 You can also use your favorite pie crust recipe. While Crust is cooling, add pumpkin, brown sugar, cinnamon ginger, nutmeg, salt, and cloves to a medium saucepan and whisk to combine. Cook over medium-high heat for 4 minutes, stirring constantly. Remove from heat and whisk in evaporated milk followed by eggs and vanilla. Pour filling into cooled pie crust. Cover edges of pie crust with foil or pie shield. Bake at 350 degrees for 40-50 minutes – UNTIL pie is cracked around the edges and the center barley jiggles. 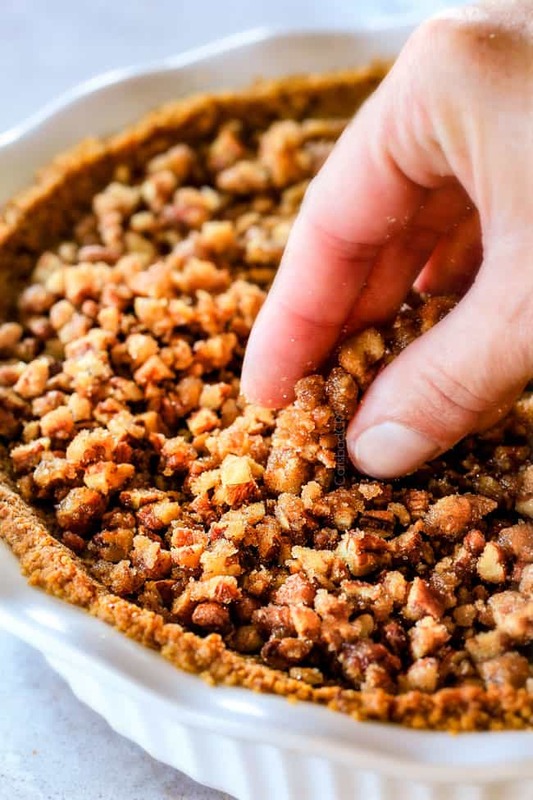 While pie is baking, add pecans, brown sugar and salt to a bowl and stir until evenly combined. Add corn syrup and vanilla and mix until evenly moistened. Sprinkle Topping evenly over filling then evenly sprinkle with 1 tablespoon sugar. Remove foil from crust and return pie to oven and bake 10-20 minutes or until toothpick inserted in the center comes out clean. Let pie cool on a wire rack for at least 2 hours. Pie can be made and cooled 2 days ahead of time then wrapped in plastic and refrigerated. Bring to room temperature before serving.